Prolactin (PRL) exerts pleiotropic physiological effects in various cells and tissues, and is mainly considered as a regulator of reproduction and cell growth. Null mutation of the PRL receptor (R) gene leads to female sterility due to a complete failure of embryo implantation. Pre-implantatory egg development, implantation and decidualization in the mouse appear to be dependent on ovarian rather than uterine PRLR expression, since progesterone replacement permits the rescue of normal implantation and early pregnancy. 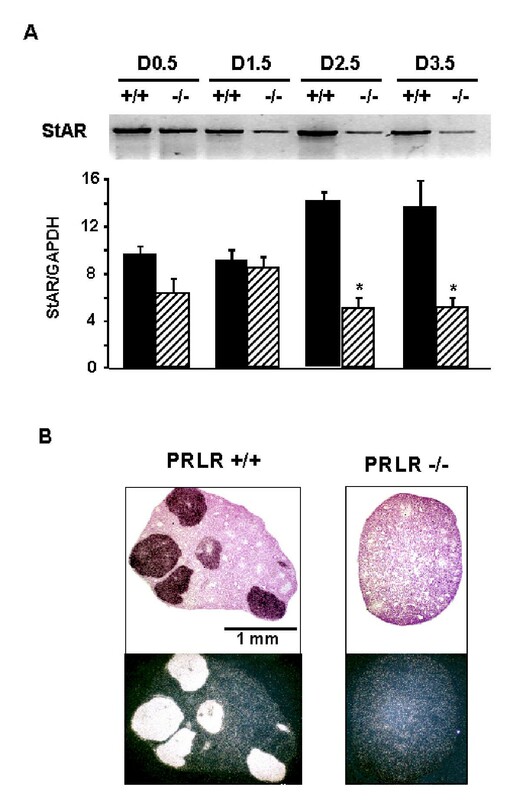 To better understand PRL receptor deficiency, we analyzed in detail ovarian and corpora lutea development of PRLR-/- females. The present study demonstrates that the ovulation rate is not different between PRLR+/+ and PRLR-/- mice. The corpus luteum is formed but an elevated level of apoptosis and extensive inhibition of angiogenesis occur during the luteal transition in the absence of prolactin signaling. These modifications lead to the decrease of LH receptor expression and consequently to a loss of the enzymatic cascades necessary to produce adequate levels of progesterone which are required for the maintenance of pregnancy. Prolactin (PRL) is a multifunctional hormone involved in diverse processes such as luteal function and thus maintenance of the pregnancy , and has long been known for its luteotropic actions in rodents [2–5]. Hormonal responsiveness in the mammalian ovary involves complex cellular processes that are essential for organ function and which can be deleterious if inappropriately orchestrated. After ovulation, subsequent luteinization leads to the formation of the corpus luteum, which is an endocrine gland of limited lifespan. This resulting corpus luteum is a highly vascularized endocrine organ producing progesterone, essential for uterine preparation and maintenance of pregnancy. The granulosa cells remaining in the postovulatory follicle undergo luteinization, which involves exit of the cells from the cell cycle, cellular hypertrophy, acquisition of steroidogenic morphology, and expression of cytochrome P450 cholesterol side chain cleavage. We previously demonstrated that female mice homozygous for a disruption of PRL receptor (PRLR) gene are infertile due to a failure of implantation . PRL mediates its action via a single receptor, which is present in the corpus luteum during pregnancy and is also expressed in the uterus later in the pregnancy . The PRL receptor is thus a key component regulating ovarian function and governing the regulation of progesterone secretion and, in fact PRL may trigger an early signal to induce the maintenance of the corpus luteum. In rodents, semi-circadian surges of PRL secretion are induced by cervical stimuli, which are believed to be responsible for the conversion of the corpus luteum of pregnancy (CLP) from the corpus luteum (CL) of the cycle. The CLP secretes a sufficient progesterone amount to maintain pregnancy [8, 9]. The factors affecting sterility of PRLR-/- mice were attributed to multiple causes, in particular to the absence of sufficient progesterone to support implantation and subsequent placental development and maintenance . Since the corpus luteum is the unique source of progesterone production in rodents, progesterone administration is able to rescue preimplantation egg development and embryo implantation in PRLR-/- female . To better understand PRL receptor deficiency, we analyzed in detail follicular development, the ovulation process and the subsequent expression of specific mRNAs of enzymes involved in steroid production using RT-PCR and in situ hybridization, in a time-dependent manner, during the first stages of early pregnancy of PRLR-/- females. The present study provides new evidence to support the importance of prolactin for survival of the luteal cells in pregnant mice. Wild type and PRLR-/- female mice (129/Sv) were generated by intercrosses of heterozygous mice (PRLR+/-). Offspring were genotyped by PCR analysis as described previously . The morning of finding a vaginal plug was designated day 0.5 of pregnancy. Animals were housed in a 12-hour day/night cycle at 22°C and relative humidity 50% with food and water ad libitum. Experimental designs and procedures are in agreement with the guidelines of the animal ethics committee of the Ministère de l'Agriculture. Vaginal smears from 12 PRLR+/+ and 15 PRLR-/- 11-week-old females were collected every day for a 21-day period. Smears were streaked on slides and estrous cycle stages were determined. Eggs were recovered from the oviduct or uterus of the mice as previously described . Wild type and PRLR-/- ovaries were collected on days 0.5, 1.5, 2.5 and 3.5 after observation of a vaginal plug, pregnancy was confirmed by recovery of eggs from the ampulla, the oviducts or from the uterine lumen. Ovaries were removed and fixed in Bouin's fixative, embedded in paraffin and serially sectioned at 5 μm, sections were stained with hematoxylin-eosin-safran. Ovarian tissues were fixed in 10% paraformaldehyde to perform immunohistochemistry of frozen sections. To examine the response to gonadotropins and induction of sexual receptivity, female mice aged 4 weeks, were injected i.p. with 5 UI of Folligon® (PMSg: Pregnant Mare's Serum gonadotropin, Intervet Inc., Millsboro, DE) to stimulate follicular growth. They were injected 48 h later with 5 UI of Chorulon® (hCG: human Chorionic Gonadotropin, Intervet, Millsboro, DE) to trigger ovulation and luteinization. After ovulation, oocytes were collected from the ampulla and counted after enzymatic dissociation from the surrounding cumulus with hyaluronidase (Sigma; 100 μl type IV-S; 10 mg/ml). The mean number of oocytes recovered following super-ovulation was calculated using ovaries from 10 PRLR-/- and 12 PRLR+/+. Wild type and PRLR-/- ovaries were collected on days 1.5–3.5 of pregnancy and flash frozen for detection of the endothelial immunofluorescence staining. After fixation of frozen sections with acetone, positive sites of rehydrated sections were neutralized by 0.75% glycine. Sections were blocked for 10 min in 5% fetal sheep serum (Gibco BRL®), then incubated with a 10 μg/ml concentration of the R-Phycoerythrin-conjugated rat anti-mouse PECAM-1 monoclonal antibody (BD Biosciences) for 1 h. Cells observed by confocal microscopy (Zeiss) exhibiting fluorescence were considered positive for endothelial cell detection. Negative controls, conducted with a non immune labeled rat IgG, yielded no reaction product. The occurrence of apoptosis in paraffin-embedded sections from PMSG/hCG stimulated ovaries sections was assessed by monitoring the presence of in situ DNA fragmentation using the In Situ Cell death Detection kit, Fluorescein (Roche Diagnostics Corporation, IN) following the manufacturer's instructions. At least four mice of each genotype were analyzed. Analysis involved confocal microscopy (Zeiss) to identify fluorescently-labeled cells which were considered positive for DNA fragmentation. Total RNA was extracted from super-ovulated ovaries by modified guanidine isothiocyanate phenol chloroform (Trizol), 1 μg was reverse transcribed using 1 μg oligo-dT (Amersham Pharmacia Biotech), 200 U of M-MLV reverse transcriptase (Gibco BRL®), 1 mM of dNTP and 40 U of RNAsine (Gibco BRL®) for 30 min at 37 C. The amplification of transcripts was performed with specific primers listed below (5 mM each) using Taq polymerase (Gibco BRL®) on 1 μl of the RT reaction in a mix containing 0.5 mM of dNTP, 2.5 mM of MgCl2 (except for IGFBP3: 1.5 mM), in 20 μl final. PCR was carried out for 15, 20, 23, or 30 cycles to insure the linear amplification, with an annealing temperature of 61 C, except for 3β-HSD where a 60 C annealing temperature was used. The experimental conditions were such that the amplification was exponential. Products were resolved by electrophoresis on 1% agarose gel, which was stained with ethidium bromide. Data were analyzed with EDAS-120 system (Kodak digital imaging system) and software. The intensity of signals was standardized by the use of GAPDH, which was included in each experiment as an internal control. The mouse oligonucleotides primers (Eurogentec) used were as follows: Cytochrome P450 side-chain cleavage (P450scc), 5' GCCAACATTACCGAGATG C 3' and 5' ACACCCCAGCCAAAGCC 3', Steroidogenic acute regulatory protein (StAR), 5' TCGCTTGGAGGTGGTGGTAGAC 3'and 5' GCAGGTCAATGTGGTGGACAGT 3', Luteinizing Hormone Receptor (LHR), 5' CTTATACATAACCACCATACCAG 3'and 5' ATCCCAGCCACTGAGTTCATTC 3', Insulin Growth Factor Binding Protein-3 (IGFBP-3), 5' CGCGAAGGCGACGCGTGC 3' and 5' CATTGAGGAACTTCAGATGATTC 3', 3βhydroxysteroid deshydrogenase (3β-HSD), 5' GGTATTCTGAGAAGTTTTGGC 3' and 5' GGCAGCAGCACCTGTCTTG 3', 20α hydroxysteroid deshydrogenase (20α-HSD): 5' GCAGGATTGGCCAAGTCCATC 3' and 5' GTACCGAAGATTTCTGTCCAG 3'and glyceraldehyde-phosphate dehydrogenase (GAPDH) 5' GAGGGATCTCGCTCCTGGAAGA 3'and 5'GGTGAAGGTCGGAGTCAACGGA 3'. Predicted products were 426, 522, 516, 471, 577, 440 and 230 bp respectively. Protein extraction was performed in ice-cold homogenization buffer containing 40 mM Tris-HCl (pH 8), 276 mM NaCl, 20% glycerol, 2% Nonidet P-40 (Interchim), 4 mM EDTA, 1 mM phenylmethylsulfonyl fluoride (Sigma), 5 μg/ml aprotinin (Sigma), 2 μg/ml leupeptin (Sigma), and 1 μM pepstatin(Sigma), with a Polytron homogenizer. The total homogenates were centrifuged at 10, 000 rpm at 4°C for 15 min. Fifty micrograms of soluble protein were run on 10% SDS-PAGE gels and electrotransferred to nitrocellulose membranes (Amersham). The membranes were blocked with 5% nonfat dried milk in 50 mM Tris-buffered saline (TBS) containing 0.1% Tween-20 (Sigma) followed by incubation overnight with the recommended dilution of primary antibody. Antibodies used were polyclonal anti-p27 (SC-528, Santa Cruz Biotechnology Inc, Santa Cruz, CA), (1:200 dilution), monoclonal anti-cyclin D2 (SC-593, Santa Cruz Biotechnology Inc, Santa Cruz, CA) or polyclonal anti-P450scc at 1:1000 dilution kindly provided by Dr. P. Monget. The membranes were then washed extensively in TBS containing 0.5% Tween-20 (TBS-T) and incubated with 1:500 dilution of antimouse (or antirabbit IgG) peroxidase-linked antibody (Amersham Pharmacia Biotech) in 5% milk for 90 min at room temperature. After washing in TBS-T, blots were developed using an enhanced chemiluminescence Western blotting detection system (Amersham Pharmacia Biotech) and exposed to X-ray films (Konica). Ovaries were fresh frozen and serially sectioned (8 μm) using a Zeiss cryostat. Sections were mounted onto positively charged glass slides, fixed in 4% paraformaldehyde (pH 7.4) for 10 min at room temperature, washed in 2 × PBS for 5 min, incubated in 0.2 % acetic anhydride in 0.1 M thiethanolamine (pH 8.0) for 10 min and rinsed in 2 × saline sodium citrate (SSC) 2 × 2 min as described in . [35S]-UTP-labeled sense and anti-sense probes were synthesized using SP6 or T7 RNA polymerase (Promega Corp, Madison, WI). Sections were coated with the labeled probe and then incubated overnight at 45 C. After hybridization, the slides were washed at high stringency and treated with ribonuclease A (20 μg/ml) at 37 C for 20 min, washed for 30 min at 60 C in 1 × SSC and dehydrated through an ethanol series. After drying, the slides were dipped in photographic NTB-2 emulsion (Eastman Kodak) and exposed at 4 C for 5–15 days. Slides were developed with Kodak D-19 developer and fixer (Eastman Kodak) then stained with hematoxylin. Bright field photography shows the tissue histology while dark field illumination allows visualization of the mRNA. The experimental data were analyzed by Student's test, or one-way ANOVA. Appropriate pairwise comparisons between pairs of animals were carried out. Each RT-PCR experiment was independently replicated at least three times with three different mice each day of gestation. All values are expressed as means ± SEM of combined data from the replicate experiments. For quantitative analysis, ANOVA followed by Student's t-test was used. Values of p < 0.05 (*) were considered statistically significant. Preliminary observations indicated irregular estrous cycles in PRLR-/- females . These observations were re-evaluated in light of the availability of animals on a pure 129Sv genetic background. Each stage of the estrous cycle was confirmed by the cytological analysis of vaginal smears. A rhythmic periodicity with a recognizable estrus was evident in both genotypes and the length of estrous cycle was not statistically different between PRLR-/- mice (4.7 ± 0.3 days) and wild type mice (5.1 ± 0.3 days). The number of oocytes 10 to 12 h after ovulation from PRLR-/- females as well as the number of corresponding corpora lutea on ovarian sections, was statistically not different in the two groups: PRLR-/- oocytes number 9.3 ± 0.4 (n = 14) and +/+ control 8.7 ± 0.2 mice (n = 15), suggesting that ovulation rate was not altered in PRLR-/- mice. To test the ovarian responsiveness to supra-physiological levels of exogenous gonadotropins, mice were superovulated. Recovered oocytes were 31.6 ± 4.8 (n = 10) in PRLR-/- versus 37.5 ± 5.5 (n = 12) in wild type mice. These results show no statistically significant differences indicating that PRL receptor deficiency does not modify the ovarian responsiveness to gonadotropins. After morphometric analysis of ovaries, no difference was seen between wild-type and PRLR-/- mice in terms of weight and size, with all stages of follicular development being represented, including mature Graafian follicles (Figure 1A and 1B), as well as corpora lutea (CL), indicating previous spontaneous ovulation. Although CL were observed in the ovaries of both +/+ and -/- females, their morphology was different. 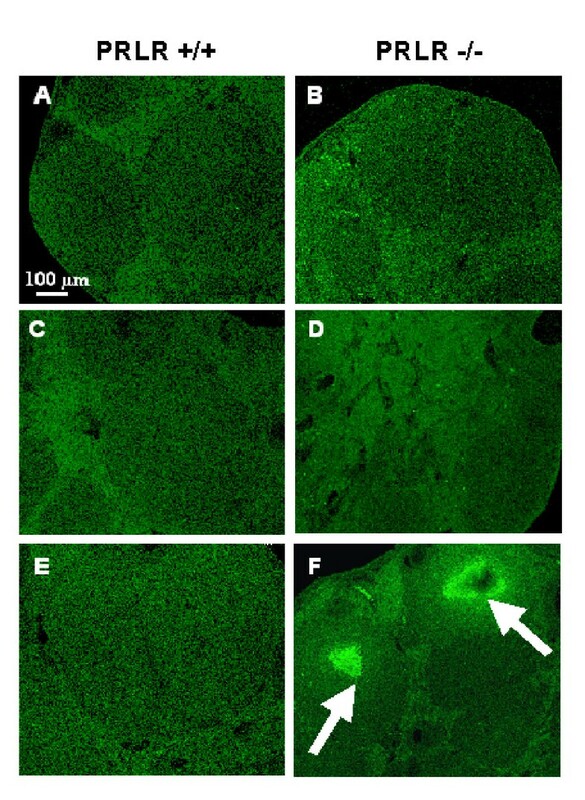 Whereas ovaries from wild-type mice had large corpora lutea with classical morphology (Figure 1C), -/- mice exhibited corpora lutea undergoing regression, where cells are highly disorganized (Figure 1D). These data indicate that a major cause of infertility is the lack of formation of the CLP, which provokes progesterone insufficiency. Histological analysis of ovary from wild-type and PRLR-/- mice. Representative view of sections of ovaries from PRLR+/+ (A and C) and PRLR-/- (B and D) from 8-week-old female mice were stained with Hematoxylin-eosin. Both ovaries contain all developmental stages of follicles (A and B), scale bar: 1 mm. Details of corpus luteum are shown in panel C and D, scale bar: 100 μm. Sections from the ovaries of PRLR-/- females taken from day 0.5 to day 3.5 after mating displayed apparently regressed CL. One of the first morphological signs of apoptosis is the appearance of nuclear fragments containing degenerate chromatin. A Tunel assay was performed on sections of stimulated ovaries enriched into corpora lutea number (Figure 2). Fluorescein staining, detecting DNA cleavage associated with apoptosis, was strongly and exclusively expressed in the PRLR-/- corpora lutea (Figure 2B,2D and 2F) from day 1.5 (Figure 2D) with extensive labeling on day 2.5 (Figure 2F) declining by day 3.5 (not shown). No staining was detected in wild type corpora lutea on the first four days of pregnancy (Figure 2A,2C and 2E). Detection of apoptosis in control +/+ and PRLR-/- corpora lutea by the Tunel method. Apoptotic nuclei are labeled green by Tunel with fluorescein detection. Corpora lutea in wild-type (A, C, E) and PRLR-/- (B, D, F) ovaries are shown at D0.5 (A, B); D1.5 (C, D) and D2.5 (E, F) after fertilization. Analysis of sections by confocal microscopy exhibits fluorescence only in PRLR-/- ovaries at days 1.5 and 2.5 (shown by arrows) of pregnancy where several apoptotic nuclei are present in PRLR-/- (D, F) compared to wild type follicles (C, E). Scale bar is 100 μm. Following ovulation, luteinization involves a number of changes in the steroidogenic cells as well as in the vascularization of the gland. The granulosa cell differentiation to luteal cells is accompanied with angiogenesis and important vascular modifications. PECAM-1/CD31 mediated endothelial cell-cell interactions are involved in angiogenesis. To follow the endothelial cells proliferation ovarian sections were assessed with CD31 (Figure 3). At day 2.5 of pregnancy the PRLR+/+ CL (Figure 3A) showed high PECAM/CD31 activity whereas the PRLR-/- CL (Figure 3B) was extremely low indicating little vascularization. Immunohistochemistry staining for PECAM-1 in PRLR+/+ (A) and -/-(B) corpus luteum. Microvessels supplying the CL did stain for PECAM-1 in wild-type whereas staining is very reduced in PRLR-/- CL (B). Scale bar, 100 μm. Granulosa cells remaining in the postovulatory follicle undergo luteinization, which involves exit of the cells from the cell cycle, cellular hypertrophy and acquisition of steroidogenic enzymes. PRL is known to affect a number of genes whose expression is essential for functional corpus luteum, such as luteinizing hormone receptor (LHR). LHR is an important stimulator of luteal steroidogenesis and acutely upregulates progesterone production through the stimulation of steroidogenic enzymes . In order to study the effects of the lack of PRL signaling on LHR mRNA expression levels, we analyzed the ovarian expression of LHR during the first four days of pregnancy by semi-quantitative RT-PCR analysis and in situ hybridization (Figure 4). The level of LHR mRNA was significantly reduced in PRLR-/- versus wild type females from day 1.5 to day 3.5 of pregnancy (Figure 4A). At this time LHR mRNA content in PRLR-/- ovaries is at least 2-fold less than the quantity detected in the wild-type ovaries. In situ hybridization experiments indicate that LHR is expressed strongly in corpora lutea, preovulatory granulosa cells and, to a lesser extent, theca and interstitial cells in wild type ovaries, while on day 2.5 the labeling is weak or undetectable in corpora lutea of -/- mice (Figure 4B right). It is well established that LH-induced increases in intracellular cAMP, leading to subsequent stimulation of StAR mRNA (Steroidogenic Acute Regulatory protein) synthesis and StAR protein phosphorylation and stimulation of progesterone synthesis in vitro . StAR is known to permit the import of cholesterol to mitochondria. Expression of StAR mRNA (Figure 5A) was significantly reduced in PRLR-/- females from day 2.5 to day 3.5 as compared to PRLR+/+ ovaries. The presence of StAR in CL was confirmed by in situ hybridization in PRLR+/+ ovaries (Figure 5B left panel), whereas no mRNA StAR expression was detected in PRLR-/- mice (Figure 5B right panel). Expression of LH receptor mRNA. A. Semi quantitative RT-PCR analysis (using GAPDH as an internal control) of LHR mRNA in +/+ (black bars) and -/- (hatched bars) ovaries at 0.5, 1.5, 2.5 and 3.5 day post coitum (d.p.c. ); upper panel, inverse picture of ethidium bromide stained agarose gel shows a typical RT-PCR reaction; lower panel, bars, means ± SEM of the densitometric analysis (n = 6 for each stage). B. In situ hybridization of LHR in ovarian sections at 2.5 d.p.c. of PRLR+/+ and PRLR-/- mice. The predominant source of LHR expression is within cells of corpora lutea. A representative section is shown at low-power magnification in bright field (above) and dark field (below) to demonstrate the histology and highlight the hybridization signal, respectively. In the absence of the PRLR, expression of LHR (arrows) is no longer seen in corpora lutea but is seen in the theca cells and in the interstitial cell population. Negative control sections probed with sense riboprobes showed no defined pattern of probe hybridization (data not shown). Expression of StAR mRNA. A. Semi quantitative RT-PCR analysis (using GAPDH as an internal control) of StAR mRNA in +/+ (black bars) and -/- (hatched bars) ovaries at 0.5, 1.5, 2.5 and 3.5 day post coitum (d.p.c.). upper panel, inverse picture of ethidium bromide stained agarose gel shows a typical RT-PCR reaction; lower panel, bars, means ± SEM of the densitometric analysis. B. In situ hybridization of StAR in ovarian sections at 2.5 d.p.c. of PRLR+/+ and PRLR-/- mice. The predominant source of StAR expression is within cells of corpora lutea. A representative section is shown. LH is known to acutely upregulate progesterone production through the stimulation of cholesterol transport to P450 side chain cleavage (P450scc) on the inner mitochondrial membrane, this enzyme is a marker of differentiated luteal cells . Steroidogenic enzymes implicated in the conversion of cholesterol to pregnenolone and progesterone were assessed using semi-quantitative RT-PCR and in situ hybrization. P450scc mRNA (Figure 6A) was significantly reduced in PRLR-/- females from day 2.5 when compared to wild-type females, whereas the expression of 3β-HSD mRNA was decreased significantly earlier (Figure 7A). While P450scc mRNAs are expressed abundantly in PRLR+/+ corpora lutea (Figure 6C, left panel), in situ hybridization showed a progressive loss then an absence at day 2.5 in PRLR-/- ovaries (Figure 6C right panel). Using Western blotting, the amount of P450scc protein was altered from day 1.5 and decreased at day 2.5 in PRLR-/- mice (Figure 6B). Expression of P450scc. A. Semi quantitative RT-PCR analysis of P450scc mRNA in +/+ (black bars) and -/- (hatched bars) ovaries at 0.5, 1.5, 2.5 and 3.5 day post coitum (d.p.c.). upper panel, inverse picture of ethidium bromide stained agarose gel shows a typical RT-PCR reaction; lower panel, bars, means ± SEM of the densitometric analysis. B. Western blot analysis of P450scc protein, equal amounts of total proteins were resolved on 10% SDS-PAGE gels and transferred to nitrocellulose membrane then probed with polyclonal antibody at D1.5 and 2.5. C. In situ hybridization of P450scc in ovarian sections at 2.5 d.p.c. of PRLR+/+ and PRLR-/- mice. Expression of 3β-HSD and 20α-HSDc. A. Semi quantitative RT-PCR analysis of 3β-HSD mRNA in +/+ (black bars) and -/- (hatched bars) ovaries at 0.5, 1.5, 2.5 and 3.5 day post coitum (d.p.c). upper panel, inverse picture of ethidium bromide stained agarose gel shows a typical RT-PCR reaction; lower panel, bars, means ± SEM of the densitometric analysis. B. Representative RT-PCR analysis of 20α-HSDc mRNA in PRLR+/+ and -/- ovaries at 0.5, 1.5, 2.5, 3.5 day post coitum (d.p.c) and at the end of pregnancy (D19.5) in +/+ mice as positive control. Functional corpora lutea synthesize progesterone, while corpora lutea undergoing regression express the 20α-HSD enzyme, which converts progesterone to a metabolite without progestational activity . 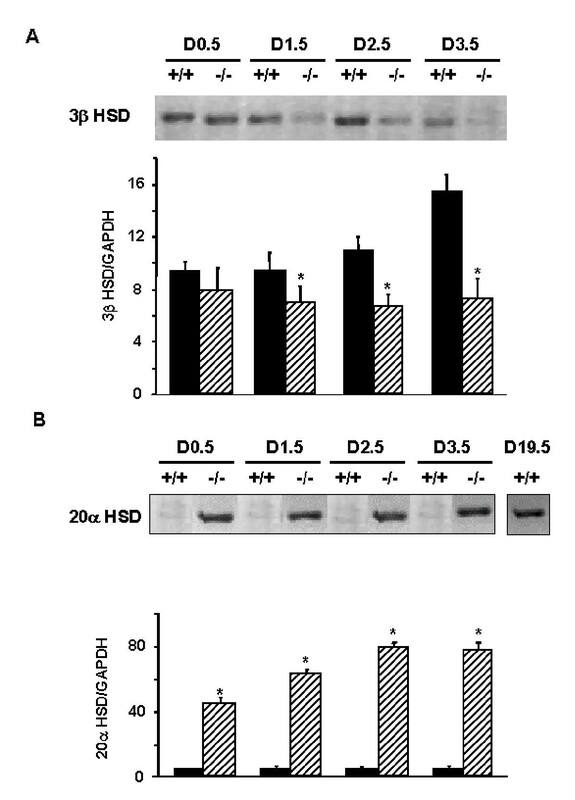 As suppression of 20α-HSD expression has been proposed to be due to prolactin, we tested the expression of the 20α-HSD mRNA, and found it to be increased in PRLR-/- females (Figure 7B) demonstrating the absence of an inhibitory effect of PRL in -/- mice. Another marker of CL is IGFBP-3 (Insulin like Growth factor Binding Protein-3) since in the ovary it is known to be expressed exclusively in cells of the corpus luteum . Transcripts were expressed at the beginning of pregnancy in wild type mice and increased until day 2.5 (Figure 8), but after day 1.5 expression in PRLR-/- females was significantly less than in +/+ mice. Analysis of IGFBP-3 mRNA expression in wild type PRLR+/+, and PRLR-/- females. Semi quantitative RT-PCR analysis (using GAPDH as an internal control) of IGFBP-3 mRNA in +/+ (black bars) and -/- (hatched bars) ovaries at 0.5, 1.5, 2.5 and 3.5 day post coitum (d.p.c. ); upper panel, inverse picture of ethidium bromide stained agarose gel shows a typical RT-PCR reaction; lower panel, bars, means ± SEM of the densitometric analysis. 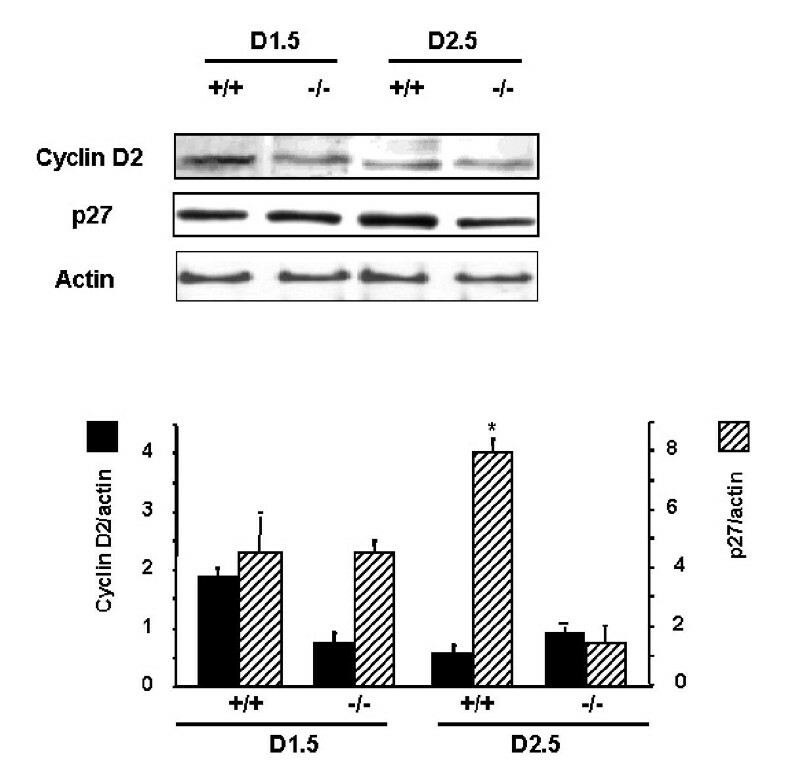 Cyclin D2 and p27 have been shown to be required for ovarian function by gene disruption studies [17, 18] The granulosa cells exit the cell cycle and terminally differentiate, the molecular evidence for this halt in cell proliferation being the loss of expression of cyclin D2 and the increased expression of p21 and p27 . To assess the relationship of theses genes products to the PRLR, we examined expression of these key proteins implicated in the granulosa G1-S phase transition in ovaries of both genotypes (Figure 9). Analysis of cyclin D2 and p27 in ovarian tissue. Equal amounts of total protein from ovaries were resolved on 12.5% SDS-PAGE gels and transferred to nitrocellulose membrane then probed with antibodies described in materials and methods section. Proteins were analyzed from PRLR+/+ and -/- mice at 1.5 and 2.5 d.p.c. Four mice of each genotype were analyzed. Equal amount of total proteins have been loaded as demonstrated by the actin signal. Upper panel, Representative Western blot; lower pane, bars, means ± SEM of the densitometric analysis of cyclinD2 (black bars) and p27 (hatched bars) after normalization of signals against actin. 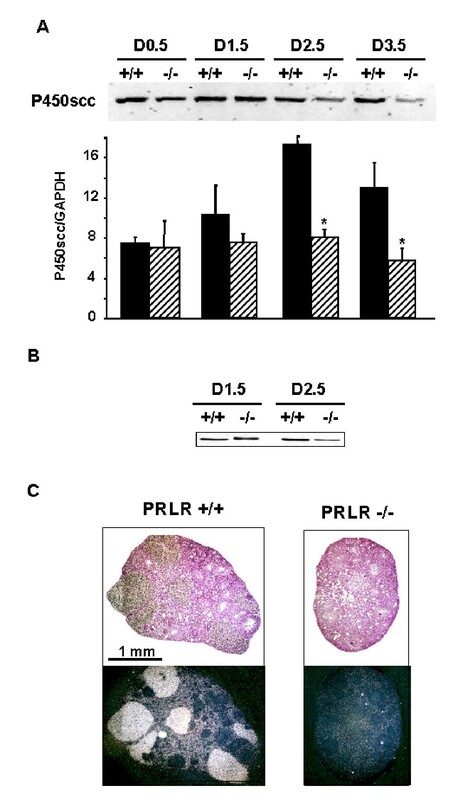 Cyclin D2 protein was down-regulated in PRLR+/+ ovaries as granulosa cells differentiated to luteal cells; these cells acquired cell cycle inhibitor p27 on day 1.5 of pregnancy. In contrast, PRLR-/- ovaries cells expressed very low levels of cyclin D2. Although initially decreased by LH, p27 did not reach high levels during the course of luteinization which was curtailed in this model. We also examined the expression of p21 in wild-type ovaries. It paralleled those of p27 but was not detectable in PRLR-/- ovaries (not shown). Therefore, ovulation induced rapid changes in the expression of p21, as well as cyclin D2 and p27, during the terminal differentiation of granulosa cells to luteal cells. This transition was greatly compromised in -/- ovaries. 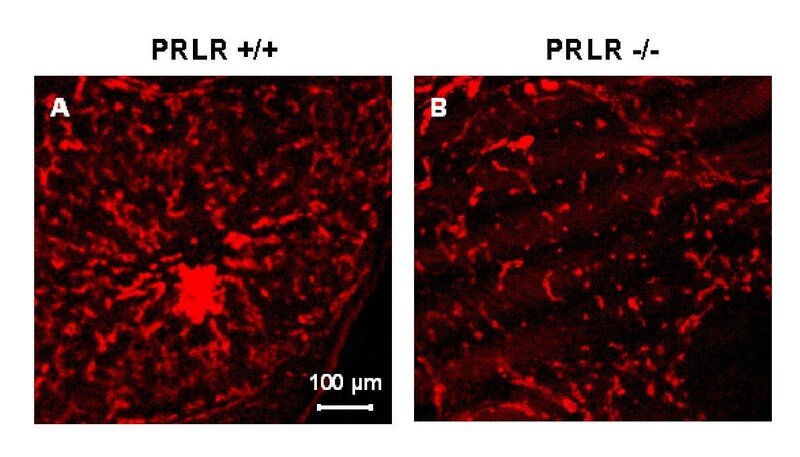 PRL has been shown to have a dual role in luteal function in the rat, with many studies demonstrating that PRL has a luteotrophic action  but that it can also induce luteolysis [12, 21]. 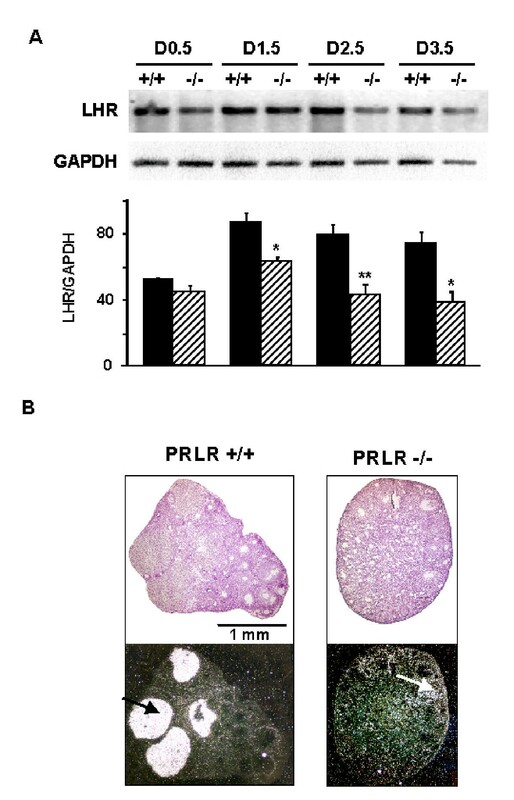 During pregnancy PRL and placental lactogens bind to the PRLR, and thus PRLR deficiency appears to be the best model to study the crucial action of PRL on the corpus luteum. Our investigations have lead us to conclude that although PRL is essential for maintenance of the corpus luteum during gestation, it is not necessary during folliculogenesis nor for ovulation and CL formation. Irregular mating patterns of half of the PRLR-/- females indicating an alteration of estrous cyclicity have been previously observed . We show here no alteration of the rhythmic periodicity of the estrous cycle on a pure genetic background of these mice suggesting that the regulatory mechanisms of estrogen synthesis are not impaired and that the absence of the PRL surge does not affect the length of luteal phase . In addition, the amount of oocytes recovered just after ovulation was not altered indicating that PRL deficiency does not preclude the presence of FSH and LH receptors, nor limit minor factors required for appropriate pituitary hormone responsiveness, providing strong evidence for an absence of a direct role of PRL in the mechanisms of ovulation. Previous investigations demonstrated that PRL exhibited dual roles, leading to DNA degradation in rat corpora lutea at proestrus  while acting as an anti-apoptotic agent in functional CL . Cells of PRLR-/- CL failed to organize appropriately and underwent dramatic apoptosis, clearly demonstrating the anti apoptotic role of PRL in agreement with a recent study . Proliferation of endothelial cells is required for the neovascularization during luteal development which results in the corpus luteum's extensive capillary network . In the rat,  it has been shown that PRL secretion, induced by mating leads to increased endothelial cell proliferation in the CL of pregnancy. Its survival beyond diestrus depends on PRL stimulation and it is associated with an increase in luteal size and vascularization. In the PRLR-/- CL, such a vascularization failed to develop and thus the presence of the PRLR appears to be crucial for the induction of vascular factors. The PRLR mediates LHR mRNA expression and thus plays an essential role in progesterone production [27, 28]. The signaling mechanism by which PRL increases the LHR expression is still not known. We demonstrated that in the complete absence of PRL signaling, LHR mRNA expression failed to increase. The changes in LH receptor mRNA parallel those in LH binding activity during ovarian cell differentiation, indicating that regulation of LH receptor mRNA is a major determinant in the expression of LH receptor numbers in these cells . The luteinization process involves exit of the cells from the cell cycle, cellular hypertrophy, acquisition of steroidogenic morphology, and expression of cytochrome P450scc. It has been reported that in order for estradiol or LH to cause cholesterol accumulation in the cycling CL, previous exposure to lactogens is required  although PRL alone can increase luteal levels of cholesterol . This is not the rate-limiting step in progesterone secretion in vivo because HDL receptor knockout mice, which are infertile, secrete normal amounts of progesterone . As a consequence of the low level of LHR expression, numerous enzymes involved in steroidogenesis and known to be under LH control such as StAR, P450scc, 3-β HSD are severely reduced. Since StAR is a key of steroidogenesis , the StAR deficient female exhibit a markedly decreased level of circulating progesterone . Moreover it has been shown that the human 3β-HSD promoter is activated by PRL through the Stat 5 response element  demonstrating that PRL has the ability to regulate expression of a key human enzyme gene (type II 3β-HSD) in the progesterone biosynthetic pathway. The outcome of direct or indirect controls via PRL or LH on steroidogenic enzymes is an absence of progesterone synthesis. However, even if progesterone biosynthesis does occur in PRLR-/- mice, it could be rapidly metabolized to 20α-dihydroprogesterone since in the absence of PRL signaling, we demonstrated an activation of the 20α HSD enzyme. One possible mechanism of action of PRL in CL may be modulation of the cell cycle. Progression through the cell cycle is orchestrated by successive activation of cyclin-dependent kinases which are regulated by specific cyclins as well as inhibitors. The LH surge induces exit from the cell cycle not only by elevating the levels of cell-cycle inhibitors, such as p27 and p21 but by completely down regulating the activator, cyclin D2 . Luteal cells then remain arrested in a non-proliferative state throughout the existence of the functional CL. Cdk4 has been also reported to be critical for luteal function, and some redundant protein(s) can compensate for the absence of Cdk4 in proliferation of granulosa cells).). In the absence of PRL signaling, our results show that luteal cells failed to express p27 at high levels as luteinization occurs. P27 deficient females exhibit granulosa cell hyperplasia and a failure of luteinizing cells to withdraw from the cell cycle and produce factors necessary to support implantation and early pregnancy . But in these mice, the circulating level of progesterone is maintained and it was proposed that growth arrest was not required for the differentiation of luteal cells to a progesterone producing state, but that it might be required to properly regulate other luteal functions. Indeed low levels of progesterone in PRLR-/- are independent of the proliferative state and the accumulation of corpora undergoing regression expressing high levels of 20α HSD would further contribute to a decrease in the levels of progesterone. The Stat5 proteins, major mediators of the PRL pathway, are essential for the development of functional corpora lutea in the ovary , this is consistent with the critical role that PRL has on ovarian function also based on female infertility of PRL and PRLR deficient mice [6, 38]. The disruption of the p27 gene results in ovarian defects similar to those observed in Stat 5-deficient mice . It is tempting to speculate that PRL regulates p27 expression and that this expression is critical for inducing the differentiation of luteal cells for the formation of functional corpora lutea. In situ hybridization studies have shown that IGFBP3 mRNA is highly expressed after ovulation in CL and selectively localized to some cell types making this protein as a CL functional marker . 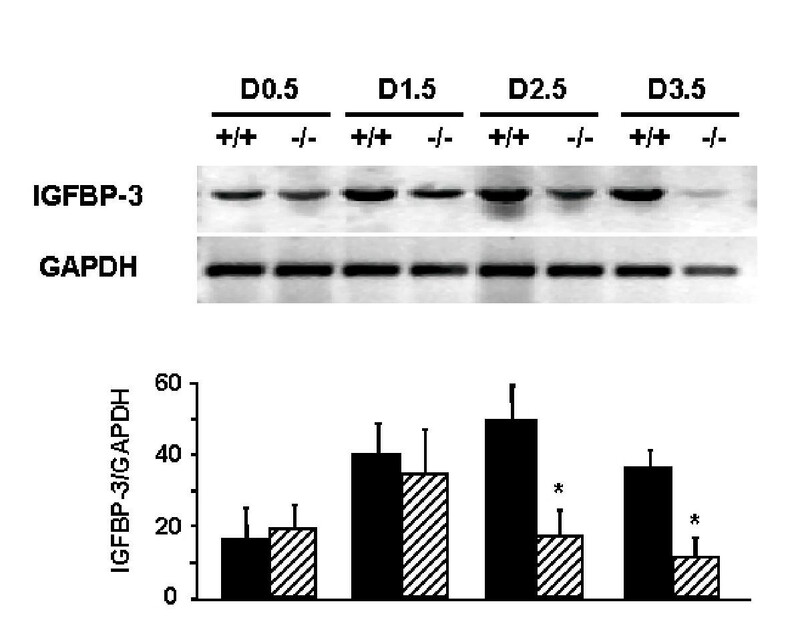 We showed that IGFBP3 mRNA expression was greatly decreased in PRLR-/- mice confirming the possible role of endothelial IGFBP-3 in controlling angiogenesis and cell responses as described in the human CL by autocrine/paracrine mechanisms . Recently, it has been shown that puromycin-sensitive aminopeptidase (PSA) deficient mice are also infertile because of impaired formation of corpus luteum due to an absence of semicircadian surges of PRL . This mouse model again underlines the importance of PRL signaling in the maintenance of the corpus luteum. 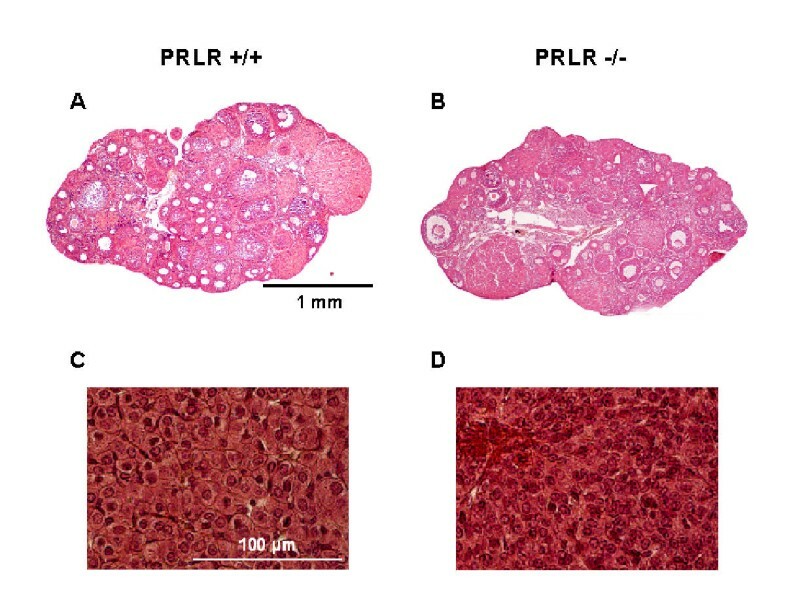 Further analysis of these different mouse models should reveal the molecular targets of PRL in the ovary, since the mechanism induced by PRL which leads to luteal cell survival regulation involves intermediate molecules still to be identified. We would like to thank Dr. Philippe Monget for polyclonal antibody to P450scc and helpful discussions and Dr. David Flint for reading the manuscript. This work was supported in part by grants from INSERM, Organon FARO 61/subv.99, Ministère de l'Education Nationale, de la Recherche et de la Technologie n° 1A010G, ARC subv. 9952.